Where is the cat? ; a horary question that is almost cliche. Why do these loveable creatures seem to get into so much trouble? Maybe it is our love and dedication to them that is the real problem. In any case it is wonderful when a chart can alleviate the stress and worry of an owner. The querent showed up at my house very distressed; she was making the rounds of all the neighbors looking for her cat, Pukka who she thought may have hidden in someone’s garden after an incident 2 days prior. Pukka had followed her to the milkbar (in Australia this is a small corner store) and as the cat followed her across the street she had been hit by a car. Pukka appeared to run under a parked car, but when the querent went looking for her, she had disappeared. The Querent is the ASC in Aries and its ruler Mars, in fall in the 4th house but trining and receiving the Sun in the 8th. The querent was thinking the worse; her significator was in the house of the grave and trine a planet in the 8th house of death and “anguish of mind”. However the applying and received trine of the Sun to Mars indicates that the querent will get some benefic and joyful light on the matter. The Sun rules the 5th (of children and pleasure) and she spoke of Pukka as being her baby. She strongly feared for Pukka’s safety. Pukka the cat is signified by Lord 6 Mercury and the Moon. Mercuryhas dignity by triplicity and term and has accidental strength being angular, not under the Sun’s beams and helped by being in a sextile aspect with Jupiter. Mercury was also conjunct the lucky star Spica; a fortunate omen! The only debility that Mercury was experiencing was that it was very slow as it had only just gone direct; this would fit in well with a cat having just been injured and hiding away somewhere, probably sleeping and not being very active. As Mercury will slowly begin picking up speed this is another good indication that Pukka will improve not get worse. 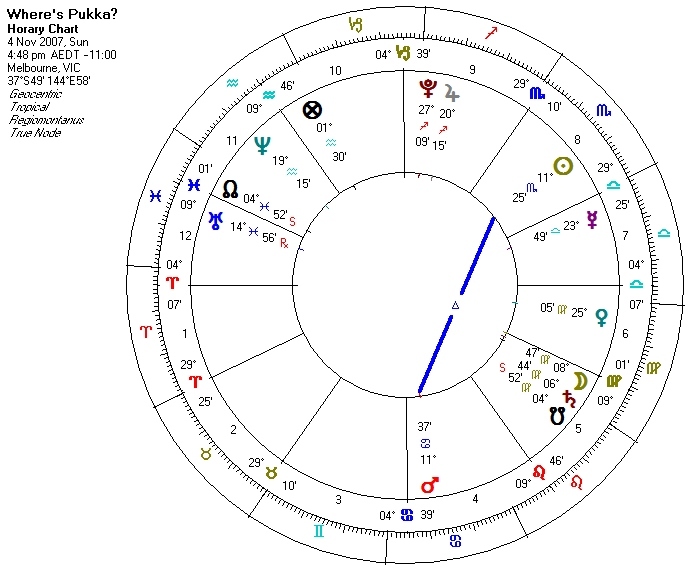 The fact that neither Mercury nor the Moon are applying to, or making an aspect to either Lord 8, Venus or the turned Lord 8 (the 8th from the 6th being the radical 1st) Mars, as well as the mutual reception between Venus in Virgo and Mercury in Libra show us that Pukka is still alive. The Moon is on the cusp of the 6th, indicating Pukka is very close by, possibly somewhere behind her house. The Moon’s last aspect was to Saturn 2 degrees before indicates the incident with the car; which had occurred 2 days before. Saturn rules the turned 6th house, so this fits in well with the cat being hurt. The Moon’s next aspect is to Mars Lord ASC in 3 degrees, suggesting the cat will be back in 3 days. And she was! As to where Pukka was hiding, the evidence suggests that she was inside or under something, close to a dry and even ground, (L 4 Moon in Virgo, Mercury in Libra); maybe a garden shed (Moon with Saturn) that was old and abandoned. There was such a shed just behind the querent’s apartment block. The old woman who owned the property would not let her go into or near the shed as she feared it was unsafe and might collapse. It was an old wooden shed, grown over and totally abandoned; a perfect place in which a cat could hide and recuperate. The important thing is that Pukka returned in three days as evidenced by the chart, she seemed to be fine though rather hungry. She was probably a bit shaken and sore by the encounter with the car and so hid away to sleep and heal. I love horaries that are quick and easy to judge! The project was a fashion runway show for some young emmerging designers and included the shooting of a promotional video. There was no money involved, though it promised to be a creative and possibly good networking opportunity. As her focus of interest is photo and props styling, she was made responsible for all props. She was now having second thoughts about the project as she had a lot of paid work on and felt that it was going to take up far more time than she first had anticipated. She also had a sense that the woman in charge of the project had subtly manipulated her into getting involved and was very vague as to the time commitment it would involve. The chart has Aquarius rising giving Saturn exalted in Libra as significator of the querent. Saturn is being sextiled by the Moon in Sagittarius who could also be taken as a significator for the querent. The project, being a creative project that falls into the category of entertainment, I gave to the 5th house and therefore was signified by Mercury in Leo in the 6th house. Mercury is disposited by the Sun in Cancer in the 5th house, which I took as the “Boss” of the project, the woman who was putting the project together and had asked my client to be involved. Both Mercury and the Sun are in the signs of Saturn’s detriment. The answer was that clearly she would not benefit from this project and in fact it was likely to be to her detriment. Mercury in the 6th implies that she will be worked like a slave and the Sun’s position in Cancer shows us how the Boss could manipulate the Moon, our querent to do whatever it wanted. The promise that this would be a good opportunity to network and make contacts, was not going to happen as Mercury, the project was already separating from Jupiter, the ruler of the 11th house who signified these contacts. However, Saturn being in a partile sextile with the Moon on the cusp of the 11th house indicates that the querent is already making contacts. A fact that she conceded. Should I direct this film clip? 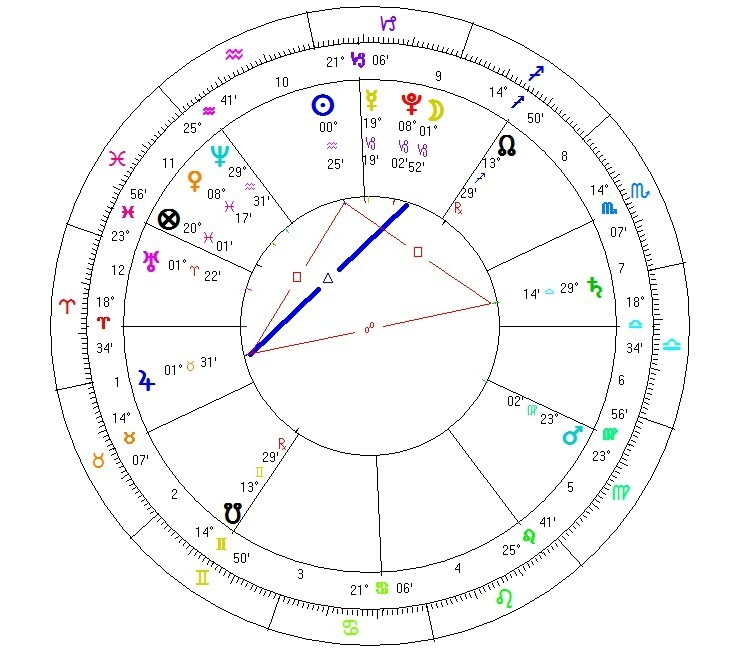 As a rule, I normally do not think that “should” questions are able to be answered with horary, but every once in a while I get a chart that is just so clear, the answer so obvious that it defies this “rule”. The querent had recorded a song and wanted to get it released but was told that without a video clip this would never happen. He has been trying to get someone to “direct” the clip as he felt totally unqualified to do so himself, though he had lots of ideas about how he wanted it to look. This chart shows the significators of the querent highly dignified and fortified, while the significator of others (7th ruler, Mercury) or employees (6th ruler, Sun) are both in bad zodiacal condition and in weak positions, giving us the answer. The querent is signified by Lord of the ASC, Jupiter in Sagittarius is on the MC. Venus being on the ASC would also signify the querent. Both are dignified benefics and on the major angles clearly providing the answer; yes he should direct the clip. The Moon also in the 10th close to the MC and conjunct Jupiter, is about to sextile the Sun (Lord 6), and Venus sextile Mars ruler of the 2nd (the money) and 9th (the vision), on the 11th cusp. With the help of friends (11th house) and hiring others (Lord 6) the job will be done. The sextile of the Moon and Sun can be understood asbringing the vision to light, as the Moon is ruler of the 5th house which could signify the creative project, especially relevant as the Moon’s last aspect was a sextile to Neptune (conjunct the Sun) and universal significator of film. Mars being exalted the vision and the friends assisting will be of a good quality. It is also interesting that the Nodes are conjunct the ASC/DES axis, showing a fated quality to this question. Having tried to find someone to direct this clip for quite a long time with no success; signified by the Sun (Lord 6) in detriment on the 12th cusp opposite Saturn in detriment retrograde, being let down by others promising one thing and not coming through. These others could also be signified by Lord 7 Mercury in Pisces and with Uranus in the 12th, very unreliable. Neither Sun nor Mercury engenders any sense of reliability and trust. The querent did go on to direct the clip with the help of friends and others. The exalted state of both Venus (the querent) and Mars (the vision and friends) show us that the querent was not 100% comfortable doing this but he was capable. It was a successful project whichsaw his vision realised. In fact you can check out the final result here. It is often said that horary works best when dealing with concrete and verifiable matters and as such is concerned with the trivialities of life. Anyone can learn the rules and techniques of horary, but it is only through consistent practice that the inexplicable correspondence between the will of the soul, the moment of asking and the celestial movements come to be revealed. It is then that a horary chart mirrors the depth and magic inherent in the most basic events of human life. The simplest of inquiries can hide a complex web of relationships and meaning that the horary chart will reveal in plain sight to any with the eyes to see. Astrology generally and horary in particular makes the truth known; but few really want to know the truth, they are happier to be told that what they already believe, is the truth. The rigorousness and discipline of horary gives the astrologer an objective framework from which to work and with which the truth and richness of life and human experience is exposed. Adrian had been planning to renovate and move into a property he owned, but he was not really happy with its location. He had recently seen a property which would suit his needs quite well and situated in a neighbourhood he wanted to live in. The asking price seemed pretty low, but it was going to be sold at auction. He had all his financing is place and planned to bid at the auction on the following Saturday. I asked this question as Adrian had been in a long term relationship with my daughter which looked to be headed for marriage and this property could end up being her home. The first thing to note is that the ASC has a very late degree rising which could mean that the matter is already settled and nothing about this matter can be altered by the judgement of this chart. At the time I did not understand how this could be relevant but have later come to see this simple question in a different light. On the surface this is a clear and simple buying and selling question. Adrian is not the querent so is signified by the 7th house and its ruler, the Moon. The seller would be the ASC and its ruler Saturn and the property itself would be signified by the IC and its ruler, Mars and the profit from this property would be signified by the MC and its ruler Venus. The next applying aspect of the Moon is a trine to Mars; there are no impediments to this aspect and it is being received, as the Moon is in the sign of Mars’s exaltation. This is about the best scenario you can get. It goes without saying that he got the property. The profit to be had from the property would appear bad as Venus is in her fall and conjunct Saturn, but he did buy the place for a relatively low price. Again I didn’t understand and thought something was wrong, but a different perspective would later make sense of this. On further consideration, the lack of planets in the angles and all the main significators positioned in either cadent or the 8th house, gives reason for concern. Guido Bonatti’s 5th consideration tells us to “consider how many ways the Moon is ill affected…whereby hindrances and damage happen in all questions…” Here the Moon is in the sign of her detriment as well as being peregrine, in the 12th house connected to Jupiter in the sign of its fall. 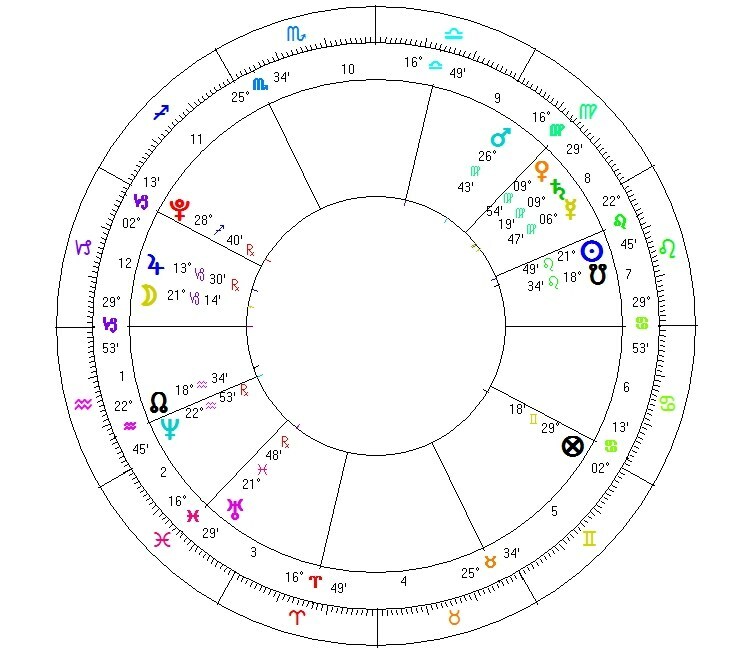 After the Moon makes her aspect with Mars she will be VOC until she comes into orb of opposing the Sun, which is considered to be an affliction to her, especially as this opposition was in fact an eclipse of the Moon at 24 Aquarius, incidently opposite Adrian’s natal Sun at 23 Aquarius. Major alarm bells are now ringing. The poor state of this Moon certainly reveals that the matter will be “hindered and damaged” and the stellium of planets in the 8th house of death is a further warning that all may not be so rosy. Further more the Moon also rules Adrian’s turned 12th house of self-undoing and makes a partile sextile to Uranus in the 3rd house opposite Mars. As it turned out Adrian purchased the property for a low price in dollar terms, but the price in emotional terms was very high; he did not profit from this move and neither did my daughter. The relationship which had been at its peak, went downhill very soon after moving into this property and ended thereafter. 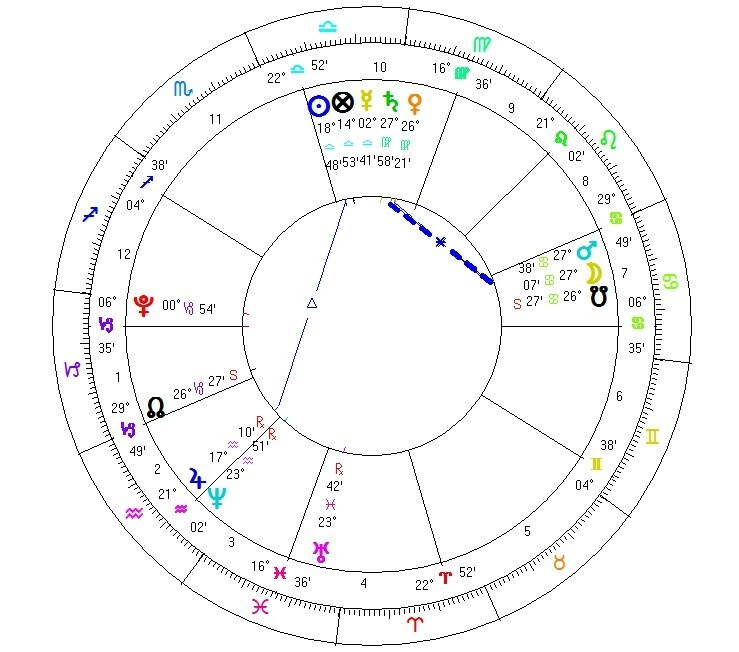 In this chart the Sun is conjunct the South Node and Adrian’s turned 2nd house hinting of the money worries this purchase engendered. Even the fact that Mars signified the property suggests strife. 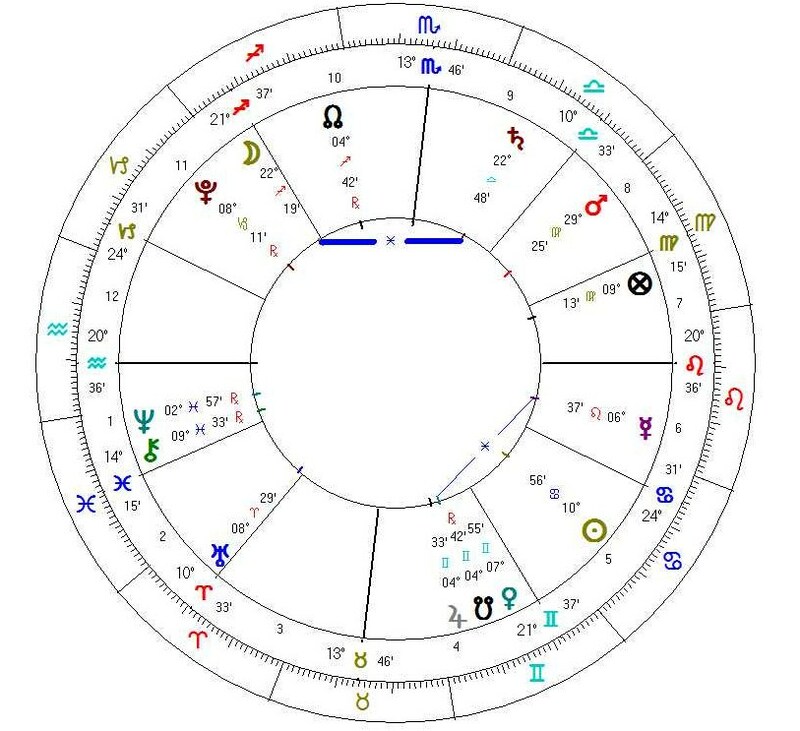 Adrian’s natal chart connects with this horary proving this to be a radical chart. The Moon is conjunct his natal ASC and Mars is conjunct his natal North Node indicating the fated nature of this matter. The North Node and Neptune of this chart sit on Adrian’s natal 2nd house cusp, mirroring the money issues highlighted in the horary chart. 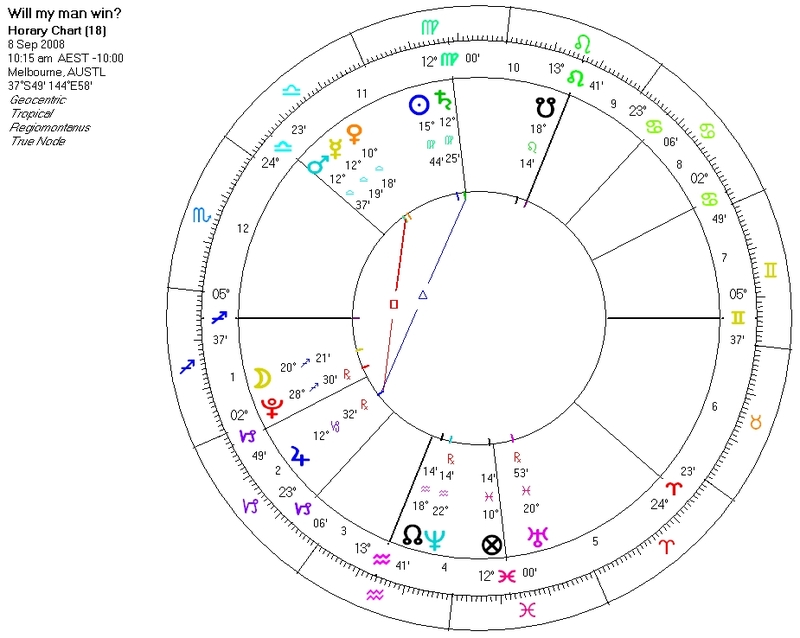 Though I asked this question with no conscious awareness of my concern for my daughter, her natal chart also connects strongly with this horary chart. 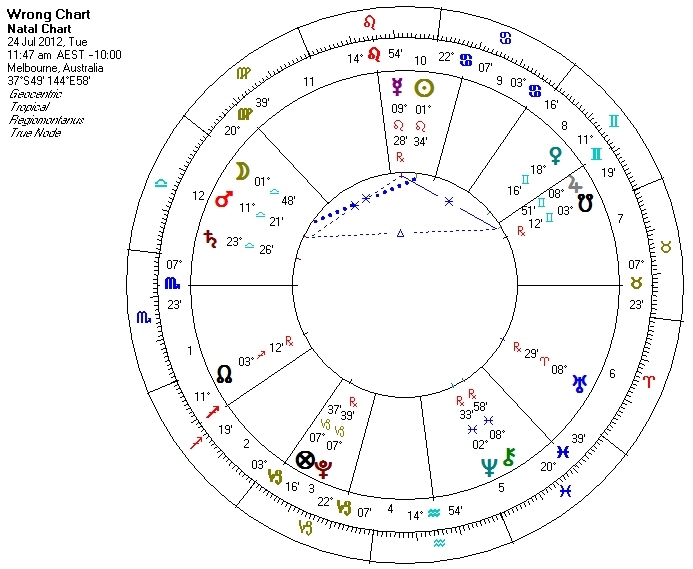 Her natal Moon sits on this chart’s MC at 16 Libra, her natal Venus is on the degree of this chart’s Mars, and Saturn was on her 11th cusp, just beginning to put his heavy damper on her “hopes and wishes”. My daughter, being Adrian’s partner would be signified in this horary by the ruler of the ASC, Saturn peregrine in the 8th house, of “mental anguish” symbolically depressing both her mind (Mercury) and her pleasures (Venus). She has since told me she felt lost, unsupported and suffered from depression during the first year in this property. With the benefit of hindsight the 29 degrees on the ASC can be understood as indicating a crisis and a change of circumstance about to happen, but I did not see this at the time. After all, the question was simply about whether Adrian would get the property and the strong testimony that he would proved true. But behind this question was a desire to see Adrian and my daughter happy and secure; yet the testimony in this chart point to strife, depression and unhappiness for both. Astrology never ceases to amaze and humble me. Far from being trivial, horary astrology is as deep and multi-layered as the world it reflects and reveals. The antiscion degree of the Jupiter (3rd house ruler) of this chart was on my daughter’s natal Uranus. The antiscion degree of the North node (on the 2nd house of money) was on Adrian’s natal Uranus. The Antiscion degree of this chart’s Uranus falls on Adrian’s natal Mars. When they broke up Jupiter and Uranus were conjunct at 27 degrees Pisces opposite Mars. (page 3-4) Guido Bonatti 146 Considerations, from William Lilly The Astrologer’s Guide, first edited in 1778, reprinted by AFA 2005 from the 1953 edition. Traditional astrology is erroneously assumed by some to be void of any psychological component; this is especially the case with horary astrology. The preconception being that horary astrology simply answers the question asked of the astrologer, predicting the outcome of a client’s fate without any sensitivity to their particular situation or feelings. This idea is easily refuted by even a cursory reading of William Lilly’s “Christian Astrology”. William Lilly was a successful astrologer living in 17th century England and is widely acknowledged as being one of the greatest proponents of horary astrology to have lived. In the first book of his classic work: “Christian Astrology” he set down the basic principles and rules for astrological delineation. In his second book he puts these rules into practice, presenting his judgement on over 35 horary charts providing the reader with a gold mine of astrological nuggets. Here we can observe this great astrologer at work and are privy to the extent of depth and detail which he extracts from a horary chart. The astrological rules of horary can be likened to the musical scales, arpeggios and technical exercises endlessly practiced by musicians. These technical exercises maybe integral to a musician’s craft, yet they are not what we hear when a musician is performing. At the point of performance it is the musician’s soul that speaks; and so it should be with the astrologer. Reading some of William Lilly’s judgement can be likened to witnessing a virtuoso’s performance, the depth and beauty of his skill leaves one in awe. Bending the rules Lilly illustrates his ability to dig deeper, beyond the fate evidenced of the chart, into the possibilities that are open to the client if they chose to make use of them in order to take an active role in shaping their destiny. Horary is not only a means of “finding the cat” or getting a simple yes or no answer to your client’s queries. Horary is the tool that will most clearly guide your client to an understanding of their present situation and what possible path they can take. The issues troubling a client may be evident in their natal chart, but practical guidance is far more difficult to extract. This is when a horary chart can be of immense help. Naturally this opened up a dialogue in order to discern exactly what the problem was. Pointing out that wanting another person to change was not a realistic way of dealing with problems in our life; she admitted her awareness of this and confessed that she had come to the end of her tetters and was at a point where she was quite prepared to leave the marriage. She also recognised that doing so would entail more than a break of her relationship with her husband; it would have far reaching effects, potentially destroy other relationships as well as see the shattering of a family. She wasn’t sure she wanted to see the marriage dissolve, but felt so exhausted by the continually repeating problems that she doubted whether it was worth the effort to keep it together. After much discussion it turned out that she wanted to know whether the situation (her marriage) would change enough for it to be worthwhile for her to stick with it. A horary was drawn up for the moment the question was clear to me, as I am the astrologer, the channel through which the stars have the ability to speak as I am conversant in their language. Over the years I have become aware of a strange sensation in my gut the moment when a question becomes clear. A gut feeling so to speak that heralds “the moment of Astrology”. If I adhere to that moment the resulting charts appear to sing louder and clearer than others. There are three important factors to consider in this chart; my client (the querent), her husband and the marriage. She would be signified by the ASC, the ASC ruler and the Moon, her husband by the 7th house and its ruler and the marriage by the 10th house and its ruler. My client is signified by the ASC ruler Saturn in Virgo, the sign of Mercury, significator of the marriage in this chart and situated appropriately in the 10th house of the marriage indicating her principle concern. Saturn is currently peregrine, meaning he has no innate power and little control, but is placed in a strong angular house and is with Venus a benefic planet that is applying to conjunct him. Venus being the universal significator of relatonship further emphasises my client’s concern about the state of her marriage. Saturn is in a partile sextile to a debilitated Mars conjunct the Moon, which he receives into his detriment; clearly describing to us my client’s anger at her husband and the situation she sees he has placed them in. Saturn is now at the beginning of his cycle (having recently conjunct the Sun) and so is increasing in light, he is also about to move into Libra the sign of his exaltation. Both are indications that my client’s significator will be gaining strength and in ability to act. Normally we would also give her the Moon as a secondary significator, but here the Moon is the ruler of the 7th house and so signifies her husband. The Moon is in Cancer and is on the 8th house cusp partile conjunct fallen Mars and the South Node. The Moon currently in his own sign indicates that he is at present principally concerned about himself and his money (Moon rules his turned 2nd house of money). The five degree rule puts the Moon in the radical 8th house of “anguish of mind”. The combinations of these factors describe an essentially honest man who is at present, in a bad place and keeping bad company. Being signified by the Moon would also suggest a man who is easily influenced by others. There is little happiness here and a lot of anger. Being in the sign of Saturn’s detriment indicates that much of this anger is likely to be directed towards my client. Soon the Moon will be moving into Leo where he loses all power and control when he becomes peregrine. He is also losing light being in the last waning quarter of his cycle. This shows us that her husband is losing strength and heading towards a position of weakness. Moon is applying to perfect a sextile aspect with Saturn, but first will conjunct Mars and carrying his light towards Saturn who is receiving the Moon into the sign of his detriment. So though there is an aspect formed and perfecting between the two there is not much agreement. The presence of Mars in this configuration shows the anger that is shared by both parties. Seeing as all of these aspects are already to the degree, but not quite perfected shows that this is the situation between the two as it stands now and things will very soon be changing as all are at the end of the sign. Ultimately this question is about the marriage and whether the circumstances within it have the ability to change. Marriage as opposed to relationship is about a contract or agreement between two people. The ruler of the 10th house signifying the marriage is Mercury in Libra. The marriage has recently under gone a shift described by Mercury’s recent ingress into Libra. Mercury is just under the Sun’s beams and will be following and getting closer to the Sun until it makes its superior conjunction at 12 Scorpio. We could interpret this as describing the marriage as becoming less visible or as having the truth of the marriage exposed. Mercury has recently had its inferior conjunction with the Sun (retrograde conjunction), and so is into the second half of its cycle. It is interesting to note that the beginning of the sydonic cycle of Mercury (the superior conjunction) was at 21 Cancer; very close to the Moon’s position. The inferior conjunction, being like the “full Mercury” point, the opposition point of greatest awareness occurred at 27 Virgo. My client’s significator is currently sitting exactly on that degree. We could say that she has a far greater objective perception of the state of their marriage than does her husband who maybe trying to hang on to the past, the old status quo which existed at the beginning of the marriage. This symbolic picture is given further weight by the Moon’s conjunction to the South Node. When Mercury makes his superior conjunction with the Sun at 12 Scorpio heralding the beginning of a new cycle, Saturn will have moved into Libra, sign of his exaltation where he will stay till Oct 2012, (though he comes very close to his ingress into Scorpio in February 2012). Taking the symbolic time of the progressed Moon as equal to that of transiting Saturn, then the Moon will remain powerless in Leo till February 2012. It was at this point that my client revealed to me some further information about the issues affecting the marriage. The issues principally revolved around money and her husband’s business dealings which were constantly getting them into problems that threatened the family’s financial security, though he has a very strong capacity of generating income. It turned out that the authorities were investigating him and that there was a very strong possibility that he would be barred from running a company or having financial control of a business for a period of two years. One of the proposed solutions would be for her to take financial control of the business. She would have the power and for the first time in their married life she would be at the forefront of their financial affairs. The Part of Fortune is in Libra, ruled by Venus who is applying to conjunct Saturn in just over 1 and half degrees. Venus also rules the 11th house which could be seen as the 2nd from the 10th in other words the house of the marriage’s money. This makes sense as money which is so much part of the problem and therefore this question. Venus is intimately connected to both Saturn and the Moon, significators of my client and her husband as well as being in mutual reception with Mercury significator of the marriage. The 11th house can also reveal to us the hopes and wishes of the querent. Ruled by Venus the planet of conciliation and with the presence of the Sun in Libra on its cusp shines a light on the truth that she is dearly hoping that the situation will change enough for her to reconcile the marriage and save her family as well as her sanity. Despite the presence of Mars, the aspect between the Moon and Saturn is a sextile indicating that there is possibility for cooperation despite the conflict. 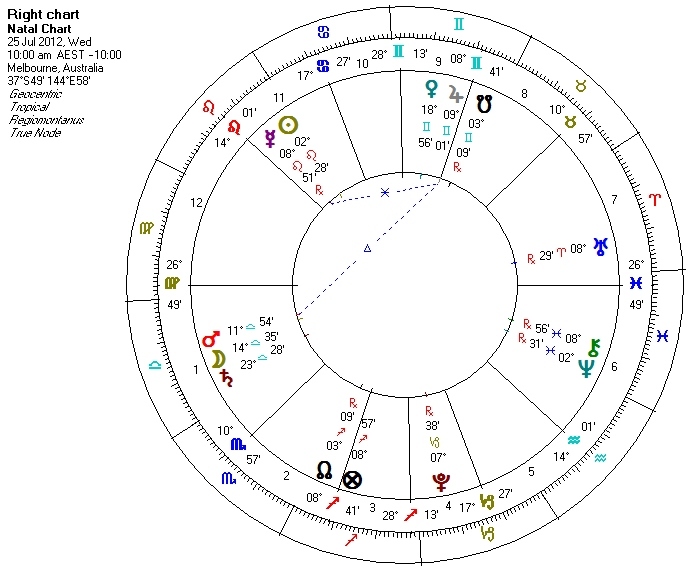 This horary chart was able to show my client the increase in power that she had already been feeling but was loathed to fully trust. Seeing her husband’s coming worsening state confirmed that he was reaching the bottom of a cycle and powers beyond him would have to take control. The timing indicated in this chart fit in with the circumstances revealed to me only halfway through the session. My client left with a renewed sense of focus and confidence, satisfied that the possible outcome to their current predicament would allow changes in the marriage which could benefit all. Traditionally the ancients saw the 10th house as the house of marriage as this was associated with ones status in the world and the 7th house being the house of the marriage partner. In some circumstances we could use the 7th house as signifying the marriage, but in light of this question we needed to distinguish between her husband and the marriage, so the 10th house was a logical choice, especially as my client’s attitude to the situation was far more rational and concerned with the practical ramifications of a break up rather than being emotional driven. See Deborah Houlding “The Houses, Temples of the Sky” page 85, published in 2006 by Wessex Astrologer Ltd. There is some debate as to when the inner planets Mercury and Venus’s cycles begin. The superior conjunction occurs when the planets are on the other side of the Sun and in direct motion, while the inferior conjunction occurs when the planets are between the Sun and Earth and in retrograde motion. Dane Rudyard set the inferior conjunction as the beginning of the cycle and this has been widely accepted since. The evidence from traditional sources refutes this and from my perspective it seems illogical to have a cycle begin when the planet is going backwards. Deborah Houlding has an article appearing in the Jan/Feb 2010 Mountain Astrologer about this very issue. I was recently asked to sit on a panel of astrologers to discuss and give our predictions on the upcoming US presidential election. Being billed as the “classical astrologer” as distinct from the mundane, modern, cosmobiological and Chinese astrologer, I decided that rather then sift through natal, ingress, eclipse and all other possible event charts I would simply ask a horary. I waited until both candidates had announced their running mates before setting out to ask my question. In horary the most important point is the asking of the question. The resulting chart reveals far more then a simple answer and is a good example of the “magic” of astrology. I am very clear as to my biases both political and personal in this election. I spent 10 years living in Hyde Park, Obama’s home turf in Chicago. I moved away at the age of 22, but my family still live there and I visit regularly. When I set the question I was very clear that this was a contest question (therefore a 1st/7th house question) and that my team or in this case man would be signified by the 1st house. Obama, my man is Jupiter in the 2nd house, in his fall and retrograde. Looks bad, but Jupiter is actually station and in roughly eight hours going direct. His opponent McCain is Mercury who is peregrin in the 11th house. The prize would be the MC and its ruler appropriately the Sun. I wondered and pondered how to identify the VP running mates and finally decided they had to be “with” the significators of the presidential candidates. Jupiter is in partile trine to Saturn as well as being received by him. Saturn seemed a perfect significator for Biden, an older man who is a longtime Washington politician. Saturn is conjunct though separating from the Sun, the Sun is the prize but as 10th house ruler can also be seen as the seat of government. The trine aspect and reception between Jupiter (Obama) and Saturn (Biden) indicates that these two can work well together and Saturn especially helps and supports Jupiter. Finding the running mate of McCain was pretty easy. As Mercury closely conjuncts two planets Mars and Venus, we have a choice. Venus may seem the obvious choice as Governor Pallin is a woman, but Mars in Libra is so close a symbol of a “pit bull in lipstick” that she has described herself as, that I couldn’t go past it. Besides Mercury is in partile conjunction with Mars and separating with Venus. 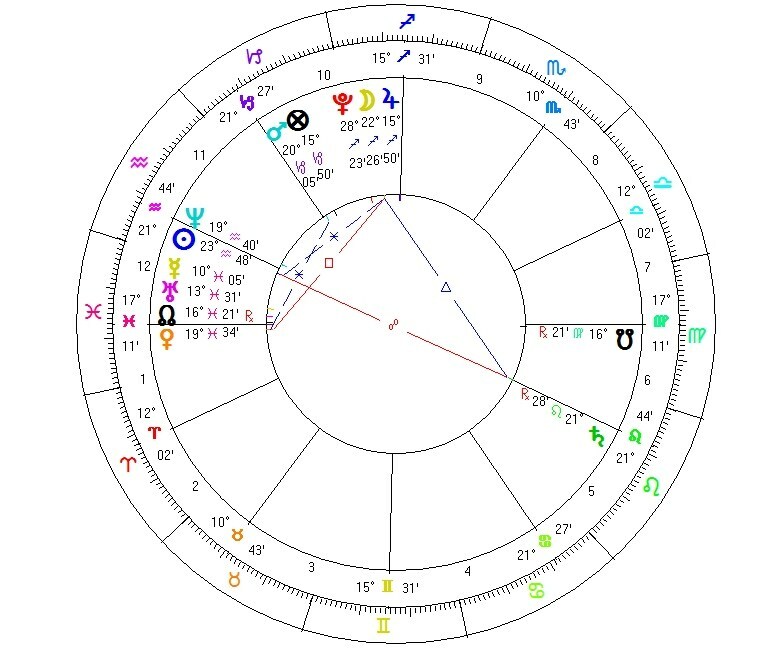 Mars in Libra is a pretty aggressive Mars, being in his detriment, and his exact square to Jupiter indicates the verbal (Libra is an air sign) attacks that Pallin had been directing at Obama. The question is who gets to the prize first? There are no applying aspects or reception between the Sun and Jupiter. Nor will Jupiter make any aspect to the MC. Mercury on the other hand will be sextiling the MC in just under 2 degrees and will also oppose the Suns antiscia degree of 14 Aries 16. These are both somewhat weak testimony, but they are stronger then the nonexistent testimony indicating an Obama win. I reluctantly had to conclude that the election will be close, but that McCain will win. I will happily forgo my reputation as an astrologer and be wrong. But there is more to this chart, consider the Moon. The Moon in horary charts is very important. She is a secondary significator for the querent, in certain questions she can be a universal significator for “the people”, as well as plotting for us the course of events. Here as a significator for the querent, that is me, she shows my bias towards Obama. Moon(I) “love” Jupiter (Obama), I am in his sign, he receives me and has power over me. All true! As the people this Moon shows their powerlessness through its peregrin state. The Moon also rules the 9th house of foreigners and as an American living abroad I can state that most non Americans see Obama as a shining hope for the future. Moon in Sagittarius ever optimistic but maybe not so realistic….just wait until it moves into Capricorn, that will be a reality check. So what does this Moon reveal to us about the course of events? From a traditional perspective when a Moon is Void of Course, meaning it will not make any Ptolemaic aspects to any planet before changing signs, it is said that nothing will come of the question or that nothing will change. In this chart the Moon at 20 Sagittarius is classically VOC, but there are mitigating factors at play here. Moon is in partile trine with Uranus, she then applies to square Neptune and finally will conjunct Pluto before her ingress into Capricorn where she will fall into her detriment. It is difficult to predict using the outer planets because unlike the other planets, they do not rule any particular part of the chart. What we can say is that there is likely to be an unexpected and shocking event (Uranus) trine, followed by a period of confusion (Neptune) and finally some show of power (Pluto). Shortly after asking this question the massive financial crash and fallout from the sub prime fiasco exploded. With Venus, the planet associated with money on the antiscia of Uranus this could be the event that this trine foretold? As more is revealed confusion and uncertainty is gripping Americans and the world (Neptune square). There is a feeling that the truth is not being fully told or that the “expert” actually have no idea how this will play out. So have we seen Pluto yet? Remember that Pluto is associated with hidden treasures and very LARGE sums of money; a “bailout” of some $700 billion perhaps? Pluto is also associated with power. Will the Moon, as significator of the people, joining Pluto mean power to the people? Or will the power that be, reinforce their grip? I leave it to you to ponder that one. The revealing magic of astrology forever amazes! Who says that astrology has to be serious? If astrology is real, if it truly reflects life and the world we live in, then surely it would reflect our humour, fiction and the make believe stories we tell. Unless you have been in a coma for the last six or so years, you would be aware of the Harry Potter phenomenon. If you live with any children or young adults you would surely have the date July 21 2007 marked in your calendar, as this is the day that the last installment of the Harry Potter series will be out. In my household it has cause great excitement as have all the previous Harry Potter launches. There is much discussion about what this last installment will contain and the previous six Harry Potter books are being reread in search for clues as to what will happen. I do not believe we are unusual in our madness. Global warming, wars, elections make way for the really important stuff: Harry Potter and his fight against the Dark Lord. There has been a lot of speculation about the final showdown between young Harry Potter and the dark Lord Voldemort. That Harry will defeat him seems almost a given, after all, good always triumph over evil, but will he survive the encounter? Should he survive? What would he do with himself afterwards? Fade into the sunset? Worse of all, get a job at the ministry of magic? Rereading the first six books was not an option for me so I decided to ask a horary question to put my mind at rest and my predictions out there for all to ponder. We only have till July 21, 2007 to wait for confirmation as to the accuracy my judgment of this horary. They say that horary questions can only be asked if we seriously need to know the answer. Frivolous questions are not allowed, but this I would argue, is far from a frivolous question. I’m sure that there are millions of Harry Potter fans spending sleepless night wondering and worrying about Harry’s fate. The question was asked on Feb 5, 2007 in Melbourne Australia at 3:17 pm, giving us a 29 Taurus 50 ASC. The planetary hour is Moon making it compatible with the Taurus rising chart. The late degree of the ASC could be a problem; it indicates that it is too late to ask. Harry Potter’s fate it has already been set in stone (or at least on paper) by JK Rowlings. There’s nothing we can do to change the outcome, from that perspective it is too late, but this doesn’t prohibit us finding the answer to our question in this chart. As he is a stranger to me the querent, Harry is 7th house. Scorpio on the cusp makes his significator Mars, exalted in Capricorn, a very apt description of our young hero especially as he is placed in the 8th house of death showing us that death is on his mind. He is disposited by Saturn in detriment and retrograde in his turned 9th. His growing sense of the responsibility he has been fated to carry would weigh heavily on him. As well Saturn is co-ruler of his turned 2nd house of his resource and could represent those who support Harry including; fellow students and member of the DA (Dumbledore’s Army) and the Order of the Phoenix, who have all been devastated by the loss of their exalted leader, Albus Dumbledore at the end of book six. That Capricorn is intercepted may show us that there will be some unexpected allies who will appear. The last aspect Mars (Harry) made was a trine to the Moon at 14 degree 30 just after his sextile with Uranus at 13 degrees. He did encounter an explosive battle just before the funeral of his mentor Dumbledore and the bittersweet break up with Ginny in order to spare her the danger of being associated with him. Harry is becoming far more serious about his responsibilities (Mars in Capricorn). Death would be signified by either the radical or turned 8th house, so Jupiter or Mercury. There is no applying aspect from either to Mars (Harry). There is however an antiscia conjunction between mars & Jupiter. The turned Part of Death is at 0 Gemini and the turned Part of Danger & Violence is at 11 Gemini, so both are ruled by Mercury and again no aspect with Mars is forming. Mercury is in Pisces in detriment much weaker then Harry Potter Mars in Capricorn. The antiscia between Harry and the radical lord of death, Jupiter is not enough to indicate his death, though it may show us that he will come close to it and may even appear dead. So Harry will survive, but what about Lord Voldemort? Lord Voldemort is signified by the house of open enemies, the turned 7th house. He is Venus in Pisces exalted on the MC. Venus is applying to square Jupiter (Lord of 8th ruler) just after she encounters by conjunction explosive & erratic Uranus. She will then conjunct the North Node before the sextile with Mars (Harry) perfects at 22 Pisces. Jupiter in Sag (death) is stronger then Venus in Pisces (Lord Voldemort), which is also being received by Jupiter. Death receives the Dark Lord. The Parts of Death and Danger & Violence, tell us the same story. At 0 and 11 degrees of Sagittarius respectively, they are also ruled by Jupiter (ruler of death) which will square Venus in 5 degree 21 minutes. Could this be the 5 month and 11 days before his public demise, very close to the July 21 2007 date for the release of “Harry Potter and the Deathly Hallows”? Wanting to be thorough I looked for any relevant fixed stars. On Harry’s side I found that Mars was with Ascella (13 Cap 41) which according to Vivian Robson is “of the nature of Jupiter and Mercury and gives good fortune and happiness”. Conjunct the 7th house cusp I found Bungula (29 Scorpio 38) which has “the influence of Jupiter and Venus and gives beneficence, friends, refinement and place of honour.” Not bad for our hero! My judgment is clear; Harry will struggle and may have a few setbacks (Mars in the 8th disposited by Saturn in detriment and retrograde), he may even appear to die, but will survive in the end with the help of friends known and unknown. As for Lord Voldemort, he will seem to triumph at first (Venus on the MC) but in the end he will be either blinded or disfigured before meeting his violent death possibly at the hands of one of Harry’s supporters. I judge that support for Harry will come at the eleventh hour from an unlikely or unexpected quarter and that there may be some ambiguity in the demise of the Evil Dark Lord. Being a powerful wizard well versed in the dark arts he may cheat or make a deal with death (Venus squares Jupiter with reception), but be slain in his final encounter with Harry (Venus sextiles Mars). As a postscript, it is likely to that Harry & Ginny will get back together after the final battle. After all Mars makes its sextile aspect with Venus at 22 Pisces, after Venus encounters Uranus & Jupiter. After Lord Voldemort is finally vanquished, Venus can go back to being Ginny to Harry’s Mars. Now for anyone out there still skeptical about the validity of this chart let me tell you a little story about the Pleiades. They were the seven daughters of Atlas & Pleione. Six are visible: Alcyone, Maia, Electra, Taygete, Celaeno and Sterope but their seventh missing or lost sister is said to be Merope who married a mortal and hid her face in shame at being the only one not married to a god. Any keen Harry Potter fan would recognize that Merope is the name of Lord Voldemort’s mother, who like her mythical counterpart shamed her family by marrying a mere muggle (a non-magical person); Tom Riddle. Herein lays the true mystery of astrology. Not one to usually toot my horn, I will now do so. For any of you that haven’t read Harry Potter and the Deathly Hallows here is a round down of the important points: in the final battle between Lord Voldemort and Harry, Harry does appear to die, but doesn’t, His friend Nevil becomes an unlikely hero and bad guy Snape ends up being the good guy after all. Oh! and Harry does end up with Ginny. So the blinding of Voldemort doesn’t happen, unless you count the more symbolic blindness of not seeing Harry’s true strengths… Don’t you just love astrology!